Pipe jacking and microtunnelling, including pilot auger microtunnelling, are essentially from the same family of pipeline installation techniques and can be used for installations from about 120 mm diameter upwards. A pipejack is defined as a system of directly installing pipes behind a shield machine using hydraulic jacking from a drive shaft, such that the pipes form a continuous string in the ground. The pipes, which are specially designed to withstand the jacking forces involved, form the final pipeline once the excavation operation is completed, or can form a conduit into which other services may be placed at a later date. Within this description, microtunnelling is specifically defined as being a steerable remote-controlled shield system for installing a pipejack with an internal diameter less than that permissible for man-entry. Microtunnellers often use a laser guidance system to maintain the line and level of the installation, though, as with larger pipejacking installations, both laser guidance and normal survey techniques can also be utilised. Pipe jacking and microtunnelling techniques are normally used for main or trunk pipelines. Pilot/Auger systems are a type of hybrid between a directional drilling system and a ‘traditional’ microtunnelling system.Here a drill string is used to bore a pilot hole on a prescribed line and level using a laser theodolite aimed at a target situated just behind the boring head. The bore is reamed to the pipe diameter using an auger chain once the pilot bore is complete. Finally the pipe is jacked into position in the void created. This system is normally for smaller diameter and/or shorter bore lengths such as branch and/or lateral pipeline connections. Modern technology has, in recent years, enabled these methods to be applied to a wide range of ground conditions from waterlogged sands and gravels, through soft or stiff, dry or waterlogged clays and mudstones, to solid rock. Pipejacking, microtunnelling and pilot auger systems are well suited to situations where a pipeline has to conform to rigid line and level criteria, since the guidance and control systems allow accurate installation within close limits of the target. One of the most common applications is for gravity sewers, where not only is the line and level critical but the depth is such that the techniques tend to become more cost-effective when compared with open-cut installation. Most microtunnelling drives are straight between shafts, although increasingly in recent years various companies have developed guidance systems that enable curved drives to be completed, particularly on longer length, larger diameter bores. Where, because of the curvature of the tunnel, line-of-sight is not possible between the drive shaft and the microtunnelling machine, alignment systems based on, for example, gyroscopic devices or moving laser systems may be used as an alternative to the more usual laser equipment. Several different excavation techniques are used in pipejacking. The first requirement for a pipejack, microtunnel or a pilot auger drive is that a drive shaft should be sunk according to the requirements of the system being used. In all cases a thrust wall against which the jacking frame can operate is needed such that the jacking forces will not cause damage to or misalignment of the shaft. Excavation of the ground within the pipejack can be from basic hand excavation using an open shield, to backacter in more difficult ground conditions or a cutter boom or rotating cutter head. In most cases these systems are used in conjunction with open face shields and rely to a large extent on the ground at the face being self-supporting to some degree. Excavated spoil is removed from the face using mucking skips or a conveyor-belt loading into a hoisting system at the shaft bottom. Where the ground is not self-supporting, a closed face shield is generally used. Here excavation is achieved using a rotating cutter head. The spoil removal technique maintains a sufficient level of support at the face by using either a spoil removal slurry under pressure, or by limiting the amount of broken ground taken from the cutter chamber known generally as Earth Pressure Balance. Two predominant systems of spoil removal are employed at the smaller diameters associated with microtunnelling. In self-supporting soils where the head of ground water pressure does not exceed about 3 to 4 m, it is possible to use an auger flight to remove broken ground. In more difficult ground conditions and at higher ground water heads, a recirculating slurry system is more often used. The slurry system requires a suspension of bentonite or specially designed man-made polymer (or a combination of the two) to be prepared at the surface. This suspension is pumped to the cutter chamber via a system of pipes arranged within the Jacking pipe. If necessary, the slurry is pressurised to a level required to maintain face support. In the cutter chamber the slurry mixes with the excavated ground, and this mixture normally passes through an in-built cobble crusher with an eccentric radial motion to ensure that no ground particle larger than the slurry system can handle enters the return side of the system. The mixture is pumped to the surface where the soil particles are removed from suspension by simple gravity decantation or by using centrifugal forces within hydrocyclones or similar apparatus The newly cleaned slurry is monitored and reconditioned and recycled through the system. The slurry system has the advantage of being continuous, whereas auger-based methods which require the hoisting of spoil are more cyclical and involve interruptions to the operation of the cutting head. There is also a system which utilises a hydraulically controlled sealing door to limit the ground removed during excavation, with spoil removal being completed using a scraper system within the jacking pipe. This system does not normally use a cutter head, but relies on a cutting rim on the leading edge of the shield to loosen the ground, causing it to fall away from the face. Two other specialised microtunnelling techniques are available for small bores of less than about 200 mm diameter. The first is a simple compaction method in which the rotating ‘cutter’ head of the microtunneller does not remove the ground from the face so much as pushes it aside, compacting it around the perimeter of the bore. The second is Pilot Auger microtunnelling as described above. To complete a drive using pipejacking, microtunnelling or pilot auger microtunnelling, a reception shaft is needed. The dimensions of this shaft should be such that the pipejacking or microtunnelling shield, or auger casings in the case of Pilot Auger microtunnelling, can be recovered without difficulty. As these shafts are not normally used for jacking operations there is no need for abnormally high strengths or thrust walls. Pipe jacking, microtunnelling and pilot auger systems are more often than not supplied with jacking frames as part of the purchase package. Frames are designed to provide the level of jacking pressure likely to be required by the shield being used on any given project. The requirements for the jacking frame on any project are determined by the ground conditions, length of drive and the type of shield being used. As well as the main jacking station and particularly on longer and more complex drives where, for example, the length of the pipe string is such that its resistance to movement will exceed the capacity of a practical sized jacking frame, or where friction forces or ground movement factors will be difficult to overcome, lubrication of a pipe may not be sufficient in itself to allow successful completion of the jacking operation. An option that should be considered before reducing the planned length of a pipejack is the ‘Interjack’ station. An interjack station is a ring of hydraulic jacks within a steel framework that is inserted into the pipe string at strategic points. Each interjack divides the pipe string into more manageable jacking lengths. Each length, whether between jacking frame and interjack, interjack and interjack, or interjack and face, can be advanced individually and independently from the rest of the pipe string. It is the equivalent of having several smaller pipejacks in operation at the same time in the one bore, with each interjack using the pipe length behind it as its thrust wall. The use of interjacks reduces the potential for pipe failures, since the maximum force on any individual ‘sub-string’ depends on the number of pipe sections plus the friction factor over that length of pipe. Each interjack is controlled independently from the operator’s station and can, where necessary, be individually lubricated with the correct control and lubrication pump set-up. The most critical factor in any pipejacking or microtunnelling project is the geology. The subject of site investigation is covered in another Section, but it is worth repeating here that, unless ground investigation is carried out properly and a thorough knowledge of the conditions likely to be encounters along a pipejack or microtunnel route are determined, the risk of putting the wrong type of machine in the ground becomes high. This cannot be over-stressed – on those occasions when pipejacks and microtunnels have failed in the past, this has been due more to unexpected ground conditions than to any other reason. Such failures sometimes lead to expensive recovery operations, failure of pipes already jacked into the ground or ultimately loss of some very expensive equipment. Because the application can be used in rock formations, given the correct cutter head, some companies not known for providing complete microtunnelling system have developed independent add-on section that are specifiaclly designed for work in hard rock conditions. Another area in which microtunnelling has been utilised successfully is the installation of a ‘Pipe Arch’. Pipe Arches are utilised where a series of casing pipe are driven into the ground, often below road ways or rail tracks, to form a preliminary support mechanism, sealing off the ground inside the arch from that surrounding it. Once the pipe arch is competed, the soils within the pipe arch are excavated within the confines and safety zone created by the arch, minimising the potential for ground movement during excavation and reducing the potential for subsidence at surface and therefore in the infrastructure beneath which the new tunnel will pass. More recent developments in the pipe jacking field have to some extent been created by combining the advantages and abilities of pipe jacking techniques with those of Horizontal Directional Drilling (HDD) – for HDD subsection click here. Developed by one of the most recognised names in the Tunnelling, Pipe Jacking and HDD sectors the two systems are known as Easy Pipe and Direct Pipe. Easy Pipe – This system has been developed to create a technology that will provide an economic No-Dig solution for the installation of a pre-prepared and tested non-tensile pipeline with relatively large diameters of between 800 and 1,400 mm over comparably long installation lengths of between 500 and 1,000 m in difficult soil types such as gravel, rubble, rock etc. Typically Step 1 of an Easy Pipe installation requires a microtunnelling unit to be prepared and assembled in the launch pit. The cutter head is launched and guided in the conventional microtunnelling way along a given planned alignment. The difference between the jacking pipes used by Easy Pipe and conventional ones is that the special design allows them to be used as jacking pipes in the forward direction whilst allowing them to be retracted from the completed bore to pull in the product pipe. This is because the joints between the jacking pipe sections bolt together with a design that will withstand thrust and pullback forces of up to 6,300 kN (630 t). The close proximity of the jacking pipes pipe’s outer wall to the bore wall also avoids the potential for collapse of the bore in unstable ground formations. After the cutter head has reached the target pit it is separated from the jacking pipe string and replaced by a specially designed connection pipe that also connects to the product pipe. The jacking pipes are then pulled back using the bi-directional jacking frame, simultaneously pulling the product pipe into position. In the launch pit the individual jacking pipes are successively removed along with all other equipment until the product pipe arrives at the microtunnel launch shaft. The lunch shaft arrangement and specially designed pipe thruster used for the Direct Pipe Installation technique. Pictures courtesy of Herrenknecht AG. The connection pipe and jacking frame are removed from the pit leaving the product pipe in place to be finally connected to the remainder of the pipeline on either side of the obstacle(s) crossed. Direct Pipe – Conversely, Direct PIpe has been developed to utilise a continuous length of ‘product’ or ‘casing’ pipe to thrust the advancing cutterhead shield through the ground. The pipe is advanced using a specially developed thrust configuration set up in the launch shaft. Using this technique the advance only has to proceed in one directio there is no pull back element to the instalation as fouind in the Easy pipe Technique. The use of a contunuous pipe length to advance the shield which will ultimately form the ‘product’ or ‘casing’ pipe required by the installation also means that there are no specially designed jacking pipes used in the operation. Auger Boring is a technique for the bored installation of a casing pipe into the ground. Product pipe or final services are then installed within the casing pipe as required. Auger Boring is a Pipejacking technique but as the casing pipe is an integral part of the construction methodology it is neccessary to understand this concept separately. The technique is normally found to be cheaper than full microtunnelling or pipe jacking but does have limitation on the range of ground in which it can operate. In its standard form, in particular very wet ground, it has its limitations, but with special adaptation it can operate in a variety of ground including rock. Depth limits are dependent on the size of excavation required to access the auger boring unit and the practical length of pipe that can be installed from what is usually quite a large dimension launch shaft/pit. As the name Auger Boring implies, the excavation technique employed is that of using a rotating auger chain/flight fitted with a cutter head. The cutter head is driven by, and is positioned at the lead end of, an auger string that has been established within the casing pipe, the auger diameter being dimensioned to the just below the full diameter of the casing to allow rotation. Rotating the helical auger chain within the casing pipe allows the cutter head to excavate the ground at the face, with spoil being removed back along the auger string within the casing pipe to the launch shaft or pit. Spoil is removed by hand or mechanically or placed into muck skips for removal as it exits the casing pipe. The system is generally unguided, so is not used for installations requiring very high accuracy in line and level, although experienced operators can achieve very good accuracy where ground conditions permit. Some systems have been developed that allow for some limited steering capability to be applied to the cutter head or to the casing pipe to counter minor deviations as they occur. The system is best applied to the softer ground conditions like clay soils and soils with contained cobbles. Some systems have been designed to handle softer rock formations with the use of a special cutter head, and as time progresses rock capability is improving. High water table and flowing ground does cause auger boring a problem as the auger flight is not generally a sealed system and the auger chain is the only means of preventing loss of ground from the face and is neither water tight nor sealable. Generally, Auger Boring systems are usually diesel or hydraulically driven and are used for non-displacement boring operations. They are designed for the installation of casing pipes from about 102 to 1,830 mm diameter over distances of up to around 200 metres although larger diameter is normally associated with longer bores. The installation process requires the establishment of a launch pit dimensioned to allow the installation and operation of the auger boring machine and the required pipe length to be accommodated within it, or at least the length of pipe that it is practical to work with. As the casing pipe is generally manufactured from steel, the welding together of lengths to create the total pipe length required is not a problem. The auger boring machine, usually operated by a single operator using controls on the body of the machine, is set up on a set of tracks or rack and pinion system on the line and level required for the casing installation. The first casing pipe length is positioned at the head of the machine with its auger flight already installed. The cutter head is at the head of this auger flight. The auger boring machine rotates the auger flight and thus the cutter head as it thrusts forwards along the track or rack and pinion arrangement. The cutter head excavates the ground and removes spoil to the start pit for manual or mechanical removal. When the auger boring machine reaches the end of its stroke, governed by the length of the track/rack arrangement, the casing pipe is released and the machine is withdrawn to its original starting point. A new length of pipe is positioned with its own auger flight in place, the auger flights are connected together to drive the cutter head and the pipe ends welded to form a continuous pipe length. 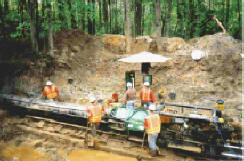 The excavation and thrust process is repeated in this way until the drive length required is completed with the arrival of the cutter head at a reception pit. The drive is completed with the withdrawal of the auger flight chain from within the casing pipe and the casing being cleaned out of all remaining spoil leaving only, the now empty, casing pipe in the ground. The product pipe(s), cables or drainage system can then be installed within the casing pipe as required, on a precise line and level if necessary.